We offer year-round hot air balloon rides in Iowa from our main locations in Des Moines and Indianola Iowa, (Home of the National Balloon Classic). We are conveniently located just one and 1/2 hours east of Omaha Nebraska and about the same distance from Iowa City and Cedar Rapids and Waterloo Iowa. We operate our hot air balloons seven days a week, with balloon flights scheduled twice daily, weather permitting. The whole balloon adventure takes from 3 to 3-1/2 hours from the time we meet to the time we bring you back to your vehicle. The ride itself will take about 45 minutes to an hour. The flight will depend upo the outside air temperature, passenger weight and available landing spots. We conclude each flight with a champagne ceremony (Welch's Sparkling Grape Juice) and a personalized 1st flight certificate and a 1st flight picture with your pilot and the passengers and you get to keep the glasses! We are a professional balloon company and that we have a 100% safety record. Please join us for the balloon adventure of your life! Bring your friends to fly with you and get a discount! Hot air balloon ride Gift Certificates are always available and make wonderful gifts for friends, family and loved ones. Put someone on cloud nine by giving the gift of a balloon flight! The breathtaking experience of a hot air ballooning adventure will last a lifetime. Hot Air Balloon Flights are offered in various locations in both Polk and Warren County. 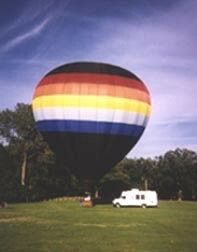 In some locations we may fly from Lake Aquabi or from Harper's Balloon Ranch located just 5 miles South of Des Moines. The winds and weather the day of your flight will determine your launch location. Special Hot Air Balloon Adventure Flights over your special locations are available for a premium. We are the only balloon company that will actually fly you over downtown Des Moines and land you safely on the edge of town "where the city meets the country". Experience the excitement of an Balloon Adventure with Z-Balloon Adventures. Hot air balloon rides are offered in Des Moines and Indianola Iowa.